If you type in “UDT 21” in Google, among other things, you can find an account of the demolition work on Okinawa in 1945. Wikipedia says that “Underwater Demolition Team”, UDT was a term first used by the US Navy in the Pacific Theatre in WW2. It seems likely to me that much of the work of UDTs – clearing beach obstacles – would be done in shallow water and would not really require the flippers and aqualungs of the kit figures. It is likely that UDTs would have used small rubber boats but I have not been unable to find out what sort of powered craft were normally used by UDTs. The kit includes a rubber boat rigged alongside the landing craft to allow divers to enter and leave the water while the boat is in motion. I have been unable to confirm if this was an experimental technique or if it was ever employed in action. The type of landing craft depicted by the kit looks like a LCA, with forward gun positions and a narrow bow ramp. The “normal” landing craft used by the USN in WW2 was a LCP(R), with gun postions at the stern and a wide bow ramp. My guess is that it would be quite hard to verify the precise equipment used by UDTs on any given date bearing in mind the covert nature of their operations and the rapidly changing technology in the late WW2 period. I have not attempted to do that research. Overall, there is at least a suspicion that Revell used a bit of licence in the combination of equipment depicted in the kit, possibly it depicts a post-war team. The figures are actually 46mm tall, which is more like 1:40 scale. At 1:40 scale the boat’s 280mm represents 11 metres long which is plausible for an LCP type craft. 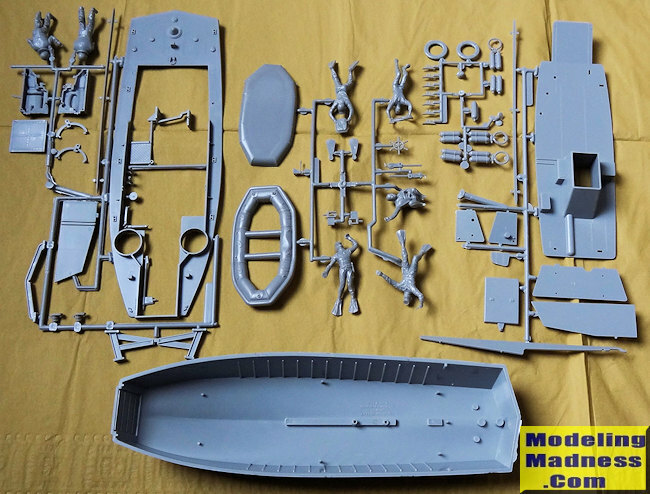 The kit is as much a set of figures with a boat as a boat with crew figures. There are 3 “frogmen” in swimming poses, one crouching, one lying down holding a hoop and 2 standing crew figures: 7 figures in all. I remember having this kit in the early 60s, so I must have made it! 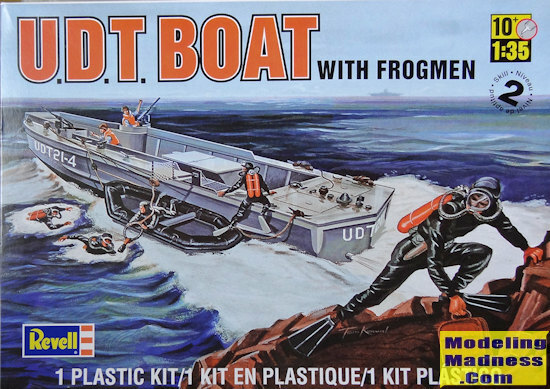 In those days it came in multi-coloured plastic and I doubt I painted it at all, it was a great toy (the hull and frogmen will float). I became a big fan of Monogram kits thereafter, even though they became less toy like. This Revell kit has a long pedigree being first released by Monogram in 1959. The most recent re-release in 2012 did not seem to sell well in the UK and kits can still be found (2016), often at discount prices. The kit comes in a rather flimsy lidded box. The parts are in grey plastic. No thread is included. There are decals. No flag is included, maybe small craft do not fly a flag. The fit of parts is not good. There are a lot of sink marks. The figures are not poseable. The facemasks of the frogmen are not flat. A lot of the detail is crude and reveals the age of the kit. There was noticeable flash on my kit, most of the parts have a slight ridge where the mould join line would be. There is a 12 page multi-lingual instruction leaflet. Colours are identified by a code letter, which is listed with a descriptive name, there is no cross-reference to an particular manufacturer’s paint numbers. Given the doubts about the scale and the accuracy of the equipment depicted it is tempting to regard this kit as a toy. Depending on how much concern one has for accuracy, and how much time one is prepared to put into research, this kit could be completed to an acceptable standard and/or as the basis for a diorama. I got the basics about “UDTs” from Wikipedia. I paid for this model myself.If you would like your product reviewed fairly and fairly quickly, please contact the editor or see other details in the Note to Contributors.